Original obituary from 1938. Contributed by Conrad Reich. 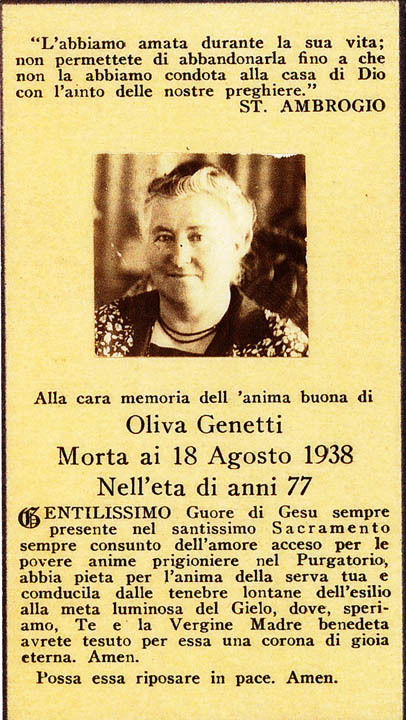 Prayer card for Oliva Zambotti Genetti – courtesy of Jean Branz Daly. Jean’s mother was Erminia Genetti Branz, one of Damiano’s five daughters. Mrs. Damiano Genetti, aged 77 years, a highly respected resident of Hazleton for many years, died at her home, 121 South Fulton Court, at 9:15 o’clock this morning after two weeks’ illness. She was the wife of the founder of the firm of D. Genetti’s Sons Inc., and the mother of the four Genetti brothers who comprise the firm which operates a large chain of food markets here and in nearby towns. Mrs. Genetti’s maiden name was Miss Olivia [Oliva] Zambotti. She was born in the Austrian Tyrol and came to America 53 years ago, locating in Lattimer. That same year she became the bride of Mr. Genetti, the ceremony being performed by the Rt. Rev. Bishop M.J. Hoban, of the Diocese of Scranton at Scranton. Thirty-two years ago the family located in Hazleton. Mrs. Genetti was a member of St. Gabriel’s R.C. church. She is survived by her husband, who is in Europe, and the following children: Leon Genetti, August H. Genetti, Albert V. Genetti, Stanley V. Genetti, all of Hazleton; Mrs. V. Bott and Mrs. Peter Zambotti of Weston; Mrs. Henry Branz of Freeland; Miss Esther Genetti and Mrs. James McNelis, of Hazleton. Twenty-seven grandchildren and one sister, Mrs. Ralph Genetti of Weston, also survive. Funeral services will be held Monday at 9 am with solemn high mass of requiem at 9:30 am in St. Gabriel’s church. Interment will be made in the parish cemetery. The Genetti markets will be operated today, tomorrow and Saturday but will be closed Monday until noon.